Posted by Michael Hoexter in Efficiency/Conservation, Renewable Energy. A few posts back in this series I reviewed the state of mobile energy storage in the form of batteries and ultracapacitors, which are in the process of getting smaller and more powerful. However, if you don’t need to move around while using energy, the amount of energy stored per unit weight and volume becomes less of a challenge, therefore the separate category of stationary energy storage. I will include in this category “transportable” energy storage meaning that the energy storage unit can be moved by crane or forklift but is not meant to operate while in transit. Why is stationary energy storage so important for a future, renewably-based grid? We have come to rely on fossil and fissionable fuels to power our on-demand electric grid. These fuels are in their natural state large energy stores: through a thermal or nuclear reaction the stored energy in fuel is released to power generators or do mechanical work in an engine. The advantages of this method of harnessing energy are that energy providers and users can accumulate and measure reserves of fuel and more or less control the timing of the reaction that releases the energy meeting the demand for electricity or mechanical work in real time. Renewable energy for the most part is opposite in that the primary energy for electricity is often intermittent natural energy flux: storage and control of energy output is something that in many cases needs to be added on. Biomass is the one exception, though as discussed in an earlier post, biomass or its refined products (biofuels) will have insufficient energy content to be the energy mainstay of advanced societies. As already explored in previous posts, most renewable energy sources, with the exception of geothermal and tidal energy, are not constant or precisely predictable sources of energy. If paired with sufficient energy storage, most of these disadvantages in the production of renewable electricity go away. So, energy storage will be an essential part of the renewable energy grid of the future as well as a smarter transitional mixed fossil and renewably powered grid. A helpful overview of some of these technologies can be found at the Electricity Storage Association’s website where there a number of diagrams that compare the different strengths of kinetic and electrochemical storage technologies (thermal storage is not covered). Having recently attended the 2007 EESAT conference co-sponsored by the US DOE, Sandia National Labs and the ESA, I am indebted to the presenters and participants at that conference for new insight into this market. Energy storage, whether used with fossil or renewable resources, can have a number of functions on or off the grid. Energy storage can be used to maintain continuity of service either in the form of an uninterruptible power supply (UPS) for a firm or facility or to plug a gap in electricity generation for the wholesale delivery of power to retail customers, particularly valuable for intermittent energy sources. If voltage sags or spikes for any number of reasons, energy storage systems can be used to compensate for the unevenness in voltage on a given power line. Energy storage can be used to regulate the AC frequency in the power system (measured in Hertz or cycles per second) to save power and protect sensitive electrical equipment. Furthermore energy storage can be used to make money or save costs by storing energy during low cost times and discharging energy during high cost periods (called arbitrage). Energy storage can also store kinetic energy for use later on, as with regenerative braking systems for large-scale electric bus and train systems. One common and potentially game-changing form of storage is thermal storage, storing energy as either heat or cold. One current common use of thermal storage is cooling chilled water with nighttime electricity, storing the cool as either ice or cold water and then using that water to run refrigeration and air conditioning during the day. This use for large buildings and corporate facilities has, under current rate structures in most markets, financial benefits as most utilities want to reduce peak demand during the day and use underutilized capital equipment during the night. However, the shifting of loads may not yield a net carbon emission benefit as night-time electricity might be more carbon intensive than daytime electricity. A greener alternative is an experimental technology where the heat of the summer sun is stored underground and used during the winter for space heating or road de-icing. This technology has not yet been widely applied nor proven as an economic alternative but a communities in Canada and in Germany have created district heating systems for storing heat for months in underground storage that promise to defray some or all of the winter domestic space heating load. One storage technique is called borehole thermal storage where a thermal fluid transfers heat to the ground through a series of holes. Most promising for the renewable grid is the use of molten salt or other thermal storage media to store the heat of the sun in the context of a solar thermal electric plant (sometimes called CSP or concentrating solar power), which use mirrors arrayed in parabolic troughs or power tower designs to concentrate solar radiation on a thermal fluid. While these solar thermal electric generation plants can be built without storage facilities, with storage included generation can be postponed for as much as a week and potentially more by releasing the heat from the storage medium when electricity is needed. This technology was developed in the 1970’s and 80’s but has only recently been the subject of renewed interest and investment. Solar thermal plants with storage can operate as either baseload or peak-load plants; the main limitation for this technology is siting these plants in regions with intense direct sunlight such as the US Southwest, Southern Spain, Sicily, North Africa, Namibia, the Australian Outback, the Middle East, and the Atacama Desert. If only parts of these areas were covered with solar thermal plants with adequate storage and there were sufficient electric transmission to load centers (cities), most of the world’s electric demand could be served by solar thermal electric/CSP plants that would, in their output profile, most closely meet the demands of grid managers and energy users. In the current regime without substantial carbon pricing, incentives or subsidies are needed to finance the building of storage facilities as these add cost to the already substantial capital requirements of building a solar thermal plant. The value of one of the highest capacity and highest power storage technologies has been recognized for many years: shuttling water between two reservoirs at different heights by means of a pumping system and a hydroelectric generation plant. Called pumped storage, electricity is generated as water flows downhill and stored when it is pumped uphill. This arrangement loses somewhere between 15 and 30% of the power to friction, evaporation, and pumping losses. In addition to a dedicated pumped storage reservoir, storage can be a component of typical hydroelectric power station with the addition of a pumping facility and a connection to the excess or cheaper power to be stored. There are over 100 pumped storage facilities in the world, the largest of which can output over a gigawatt of electricity for days at a time. Drawbacks to pumped storage are its high capital cost, geographical and environmental restrictions on siting a reservoir or dam, and sensitivity to drought conditions. Pumped storage facilities, due to their capacity and power output are being considered as one of the key technologies to help integrate large amounts of wind power into the grid, storing the output of wind turbines until it is needed. Most pumped storage is located in hilly or mountainous regions with sufficient rainfall or other water resource. An interesting pumped-storage alternative has been suggested by KEMA, a Netherlands-based energy consultancy, as a way to increase the value of the output of offshore windfarms in the North Sea. Northern European countries are increasing their use of wind power, their strongest renewable resource. Holland has no mountains to speak of but a long tradition of massive earthworks by the sea to control flooding. KEMA has proposed an “Energy Island” which would create an circular dike in the North Sea which would have a central inner “lake” at a level 32 to 40 meters below sea level. Energy would be generated from the island by hydroelectric facilities that would use seawater falling into the inner lake as their primary energy. Wind from offshore turbines or from turbines on the dikes would be used to pump water out of the inner lake. 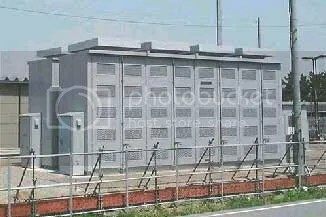 This facility would store 20 GWh of power and have an output of at least 1.5 GW for 12 hours. Somewhat smaller in capacity than pumped hydro and more complicated is compressed air energy storage or CAES. There now 2 operational compressed air storage facilities, one in Germany and one in Alabama with two more planned in the US. In compressed air storage, a large underground space (usually a disused mine) is used to contain air at a high pressure. 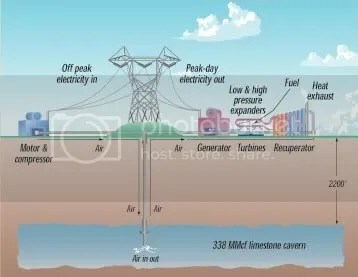 Excess power from the grid is used to compress air and inject it into the container or underground cavity. When power is needed, the air is released, expanded with the force of expansion used to drive turbines. The complexity of CAES enters in issues of dealing with the changes in the heat of gases as they are compressed or expand. Compressing air or any gas, heats up the gas, while expanding a gas, especially rapidly, requires the addition of heat to prevent excessive cooling. There are also so called adiabatic methods of compression and expansion that expand the gas more slowly and do not require heat but they will output less power. Existing compressed air storage facilities are paired with a natural gas heat source to drive the turbines to avoid the inefficiencies of adiabatic expansion. The compressed air plus natural gas turbine uses 40% of the natural gas that an ordinary natural gas plant would to generate the same amount of electricity so the compressed air might be viewed as a supercharger for a natural gas generation plant. CAES is currently used to store nighttime electricity for use during peak periods but CAES has also been discussed in connection with wind power. The key with CAES is deciding upon the ultimate design of the compression and expansion scheme including the ultimate heat source. For a renewably powered grid, CAES would need to either use biomass, geothermal or concentrated solar thermal to heat the expanding air or settle for the lower power of adiabatic expansion of the gas. If the former were the choice, the siting of the CAES plant would be restricted to where these resources were easily available. General Compression, a start up in the wind industry, is marketing a compressed air solution that uses wind turbines that output compressed air rather than electricity. A General Compression wind farm would need to be located over a geological storage cavity and also, in most cases, would need a heat source to help re-expand the gas. General Compression markets its product as “dispatchable wind”. Obviously, as with all CAES proposals, siting and the ultimate efficiency and economics of this new type of wind farm would need to be carefully examined. CAES may also compete for underground storage cavities with carbon sequestration and storage schemes if these are developed further. There are novel ideas from EnisWindgen that suggest that compressed air can be conducted to points of use through pipelines and used as both a refrigerant and a power source, thereby utilizing the cold of compressed air expansion as an air conditioner and a driver of an electrical generator. While most of us think of batteries as rather small, there are some very big batteries and battery banks out there. With increasing demand for electrical storage, some specialized batteries will just get bigger and more inexpensive per unit energy and power stored. The market for stationary batteries will also benefit from the drive to improve mobile battery storage for the electric and hybrid electric vehicle market. Batteries require and generate DC current, so conversion to AC is required through inverters to output to the grid. The cheapest batteries are still the lead-acid batteries that power typical vehicle starter motors as well as most current battery electric vehicles, including forklifts and neighborhood electric vehicles. When put together in large battery banks, these are often used as part of a backup power (UPS) system for facilities that need to maintain power to sensitive and business critical equipment. Electric utilities can use these battery systems instead of quick-dispatch fossil fuel power plants to regulate voltage or line frequency and utilize their generation plants more efficiently, thereby reducing carbon emissions. Lead acid battery banks with energy capacities of 10-20 megawatt-hours and power output of 2-4 megawatts may make economic sense depending upon the application. Lead acid batteries have efficiencies of somewhere between 75-85% meaning that 15-25% of the DC electric current is lost from recharge to discharge. There are innovations in the use of lead-acid and lead batteries that may make them more durable and increase their charge to weight ratio. Firefly Energy is about to commercialize a lead-acid battery with longer life, higher energy density, and higher power by using “foam” structured electrodes. Axion Power is also in the process of developing a lead-carbon hybrid battery-supercapacitor that will lengthen lead acid battery life, increase their power and allow faster recharge. Less well known but more energy-dense and efficient are large sodium-sulfur batteries (NaS) which are not available in smaller sizes due to the high heat required. In an NaS battery, molten metallic sodium gives off electrons during discharge (electric current) to sulfur which forms a negative sulfide ion, a reaction which then reverses with the application of current during the charge phase. The efficiency of these batteries is around 90% but if two AC/DC conversions are included the roundtrip efficiency is around 76%. NaS batteries become more economical and more efficient the larger they are with an installation in Japan as large as 58 megawatt-hours and 8 megawatts power output used to reduce peak demand. 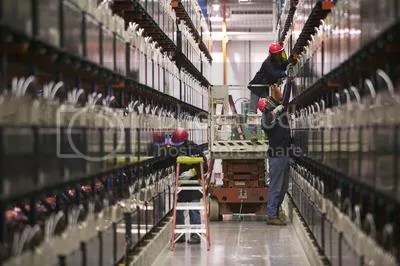 American Electric Power, the largest utility in the US, has bought some NaS batteries and is projecting buying at least 25 MWs of these batteries by the end of the decade to increase power quality. In current applications AEP is focusing on the ability of these batteries to increase the lifetime of a transformer, postponing capital expenditures but in the future hopes to pair these batteries with wind farms to enable more reliable green power output. Calculations by AEP indicate an acceptable return on the investment. In Japan, the sole manufacturer of NaS batteries, NGK Insulators is building a 34MW NaS storage facility (with a 255 MWh energy capacity) in combination with a 51MW wind farm to store the wind farm’s power and output the electricity when the grid needs the power. As this is still an experimental arrangement, a large portion of the battery costs were covered by the Japanese Ministry of Energy. A flow battery stores electrolytes in tanks and can therefore have a flexible energy capacity depending on how many electrolyte tanks one connects to the power input/output unit. The most well-known and widely applied flow battery is the vanadium redox battery or VRB. VRB’s are very efficient and respond very quickly to demand for electricity and can have a high power rating. There are currently less than 10 large VRB battery installations in the world, a few of which are paired with wind farms to balance output. VRB’s can be used as a UPS as well. VRB Power Systems of Vancouver, BC, the primary manufacturer of vanadium redox battery, claims that VRBs have the lowest environmental impact of any battery system and could have outputs of at least 10MW with multiple hours of energy. Lithium ion batteries have traditionally not been produced in large sizes and are considered too expensive for stationary storage at this time. However as there is a huge push to produce more energy dense and less expensive lithium ion batteries for electric vehicle market, some of this development effort may eventually make lithium an economic choice for stationary applications. As battery electric vehicles in their various forms (EV and PHEV) become more common, they may be able to act as an energy reservoir for the grid, if technical and economic institutions are invented that support this practice, called vehicle to grid or V2G. If many thousands and millions of vehicles are plugged into the grid at any one time, the batteries in these vehicles would be in various states of charge and might be able to send electricity back to the grid within a preset limits dictated by the vehicle owner. The vehicle owner would get payment per kilowatt-hour as well as probably some form of monthly participation payment as these withdrawals of charge are of value to the grid operators. In theory, the massed battery electric vehicles on the grid could function as an additional gigawatt-sized storage device to help smooth the functioning of a grid powered by more renewables. V2G requires the development of a smart grid, a set of technologies that allows among other things two-way communication between electricity generation and electric load. In addition V2G would require owners to set their preferences perhaps on a daily basis in terms of how much charge they need from their vehicle batteries. Compensation and/or the sense of contributing to a larger purpose would have to outweigh the inconvenience of communicating preferences to the utility and the uncertainty of the exact amount of charge remaining in the vehicle’s batteries. Less complex is the commitment by, as a leading example, Pacific Gas and Electric, the Northern California utility, to buy functioning used vehicle batteries that would otherwise be recycled. PG&E is collecting these batteries for use as an energy storage facility, thereby 1) increasing the resale value of used electric vehicles and vehicle parts, 2) reusing rather than recycling material and 3) creating a new source of on-grid storage for a low price. Flywheels use the kinetic energy of a rapidly rotating wheel or ring to store energy. Flywheels are being investigated for use in modern electric vehicles but most current applications are in the stationary energy storage market. Flywheels were used in early industrial systems to store energy and smooth the output of early power generation systems. Modern flywheels rotate at much higher speeds than the traditional flywheels of the 19th and early 20th centuries; current technology allows flywheels to spin in evacuated containment vessels at speeds of up to 50,000 rpm. The newest designs use magnetic levitation to decrease friction even further. A flywheel is attached to a motor/generator that adds power and energy to the flywheel by speeding it up and taps power from the flywheel by generating electricity when needed which slows the wheel down. Flywheels are very responsive and able to deliver very high power pulses so are ideal for conditioning spikes and dips in power from power plants and renewable resources. Also flywheels are able to supply peak power to devices that need brief very high power to do their work. 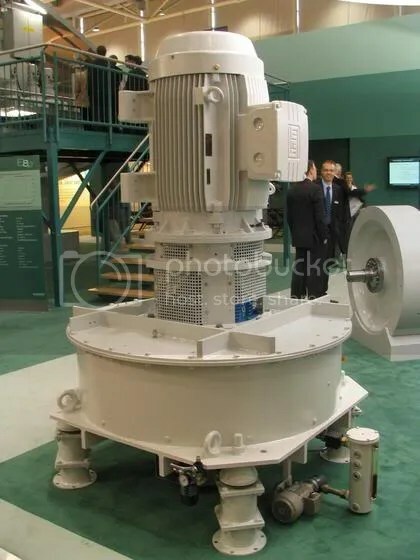 Beacon Power, one of the leading flywheel manufacturers, has been commissioned by the US Department of Energy to build a 20 MW flywheel power plant test facility containing 200 of their 100 kW flywheels [Correction: I’ve received a correction from Beacon that DOE has helped fund the design work for the plant and may offer loan guarantees as well…to be determined]. These power plants if widely used would have the capacity to substitute for fossil burning power plants in the area of frequency regulation, which requires accurate calibration of power pulses to the grid to maintain the optimal AC frequency. A study by the energy consultancy KEMA suggests that the use of flywheels in the frequency regulation market could reduce CO2 emissions by as much as 80%. Hydrogen Fuel Cells have received attention in excess of their current usefulness as energy storage devices. The may have a role in a regime of grid-wide excess production of renewable energy but are currently oversold by advocates that seem to have overlooked the inefficiency of converting electricity into hydrogen and then back again into electricity. Figures for the efficiency of the cycle range between 25% and 40%, yielding net losses of energy in the area of 60 to 75%. Current rational uses would be limited to niche applications or where oil refineries produce an excess of hydrogen as part of the petroleum refining processes. It is unfortunate that research funding for hydrogen fuel cells has over the past decade diverted attention from research into higher efficiency energy storage technologies with greater immediate or near-term usefulness. Energy storage is still a rapidly developing field with certain growth in the future, especially in a carbon constrained world. As we exploited as a society the stored energy characteristics of fossil and fissionable fuels for the last century, energy storage as a concept has not received the research and investment attention it deserves: the realization of the externalized costs of carbon-based fuels is leading to refinement of existing technologies and the potential for lowered costs. Already, energy storage technology can pay off in the higher cost areas of frequency regulation and power quality. Deferment of replacement cost for aging equipment can also pay off within several years in the use of appropriate energy storage technology. Breakthroughs in commercializing energy storage technologies will be spurred most rapidly by the introduction of realistic pricing for carbon-emissions, which will lead to investment in both renewable energy and in energy storage technologies. The liberal disbursement of pollution credits during Kyoto’s first round has not yet signaled the true cost of carbon to electricity generators and users. Higher energy tariffs for renewable energy in Spain and other European countries may help finance storage to be built alongside renewable generation capacity as part of the payment per kWh for electricity. Some energy storage technologies require investment in infrastructure that goes beyond the time horizon of most private enterprises, even utilities that manage equipment over 40 or 50 year life cycles. Such investment is typical for the massive earthworks and long-lived transmission lines that compose the conventional electric grids in most developed countries. Public-private partnerships, as has already been the case, will be required in at least the immediate future to build pumped hydroelectric projects or build massive thermal storage facilities in tandem with solar thermal plants. Planning for these facilities, while central to the grid of the future, will not yet be able to assign numbers to the value created by them, so it cannot be expected that private firms take on all the risk in building them. On the other hand, we need to start today in planning, siting and building these facilities, as well as speed the commercialization and development of existing smaller scale storage alternatives. Almost every energy storage covered here, except one. I am considering building a new house like the old “gasometers”, using the height-weight of the house as potential energy. Alternative energy generation can be direct geared to raising the house mass, obviating the need for generators. One of the advantages to removing generators is there is no peak “electical power in” for a wind turbines, and so even in very strong winds, where the generator is in danger of burning out, power is still delivered. Of course, off peak power can also be used to raise the house. 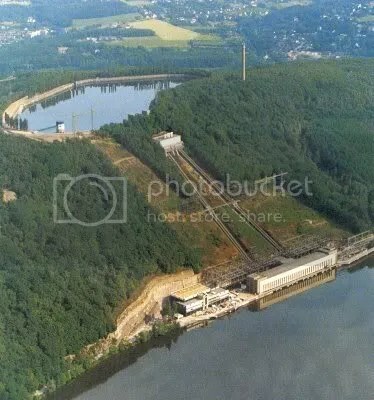 Can I get permission to use the Pumped Hydroelectric Storage photo?